Alert Protective Services is Chicago’s premier, award-winning and locally operated source for your home and business security needs. Since 1982, APS has been a leader in business and home security systems in Chicago and the surrounding area. For over 25 years, this family-owned and operated company has been standing behind their top-of-the-line products and services. APS’s first and foremost goal is their reliability. All the employees, from the owner to the operators, are all from the Chicago land area and they know exactly what types of problems and concerns local residents and businesses deal with on a daily basis. One of the biggest benefits of APS is that there is no out-of-town management. They ensure the most rapid and prompt service possible. They make it their mission to always be there when you need them. APS provides the highest level of service to secure your family’s safety, as well as the safety of your neighborhood. APS strives for customer satisfaction and loyalty. They protect every customer was if they were protecting their own home. Residents of Glenview should feel at ease knowing that they receive the best service and support APS has to offer. APS provides unparalleled 24 hour-a-day support on all their products and services. Glenview is a suburban village located in Cook County, approximately 18 north of downtown Chicago. The village has a population of 41,847 residents and 15,464 households. Glenview is known for its high standard of living and the median household income reflects that, $101,789. With over 15,000 households and an average home value of almost $700,000, Glenview is an area often targeted by burglars. Last year alone, there were a total of 574 crimes reported in the village. Most of which, 547, were property related thefts or burglaries. Only 27 were violent crimes. As a resident of Glenview, you should be aware that property related thefts and crimes affect a far larger number of homeowners and occur far more frequently. 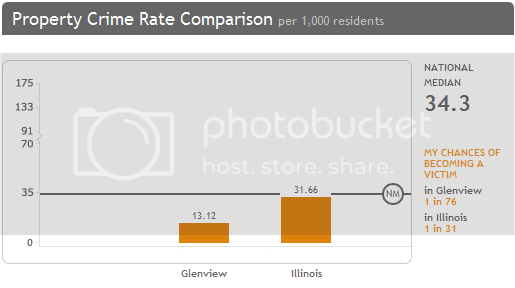 In Glenview, you have a 1 in 1516 chance of being a victim of a violent crime. This is extremely low compared to the chances of being a victim of a property theft or burglary, 1 in 76. All homeowners should have a professional from APS come out and analyze your home security needs and concerns. All residents in the Chicago land area should have some form of home security system in place in their home and/or business. In a recent study conducted by the FBI, it was found that homes with a security system in place are 15 times less likely to be burglarized. Another benefit is that most homeowner insurance policies offer considerable discounts for homes armed with a monitoring system. If you’re looking for monitoring systems that will be your most important line of defense against home and workplace invasion, look no further than the experts at Alert Protective Services. We are on hand to provide you, your family and your employees the best means of protection from intruders. Our professionals will make-to-order the best security systems for you in your home and office. APS will take into account all your personal and business requirements in order to develop the most reliable and dependable security systems to meet those specific needs. Don’t delay. Contact our certified specialists at Alert Protective Services today to make an appointment for us to install the best security system for your needs.